EAST RUTHERFORD, N.J.Isaac Redman ran for 147 yards, and scored the winning touchdown from a yard out with 4:02 remaining Sunday as the Pittsburgh Steelers rallied past the New York Giants, 24-20. The Steelers (5-3) snapped New York's four-game winning streak by overcoming some uncharacteristic sloppiness and dominating the second half. Temporary relief from the destruction of Superstorm Sandy was what New York's fans sought, and the Giants (6-3) provided it for a while. But they couldn't stop Redman or touchdowns of 51 yards for Mike Wallace and 4 yards for Emmanuel Sanders on passes from Ben Roethlisberger. 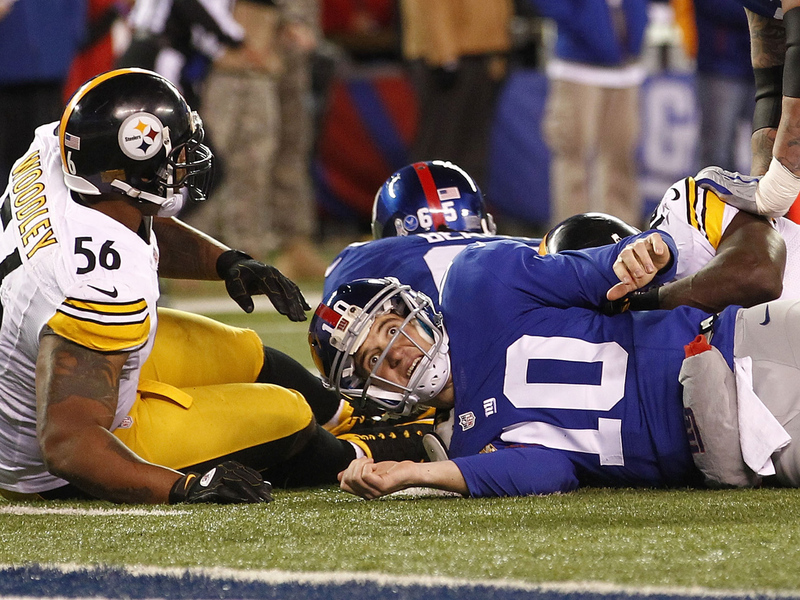 The Steelers arrived in New Jersey hours before the game, which might have accounted for their carelessness. They had the fewest giveaways in the NFL entering the game, but were neglectful with the ball and in pass coverage; cornerback Keenan Lewis had 87 yards on two pass interference penalties, and they wasted some great kick returns, too. Andrew Luck broke the NFL's single-game rookie record by throwing for 433 yards in leading Indianapolis. Luck was 30 of 48 with two TDs and broke Cam Newton's previous mark of 422 yards set last season. And it came on the day coach Chuck Pagano returned to Lucas Oil Stadium for the first time since being diagnosed with leukemia. Indy (5-3) has won three straight. Miami (4-4) got another strong performance from Ryan Tannehill, too. He went 22 of 38 for 290 yards with one TD. The rookie quarterbacks traded jabs all day, but Luck's 36-yard TD pass to T.Y. Hilton gave Indy a 20-17 lead, and Adam Vinatieri's 43-yard field goal with 6:03 left broke a 20-20 tie. Rookie Doug Martin rushed for a franchise-record 251 yards and four touchdowns and Ahmad Black intercepted a Carson Palmer pass after Oakland had cut an 18-point deficit to three late in the fourth quarter. Martin, who was born in Oakland, had a memorable homecoming for the Bucs (4-4) by scoring on runs of 1, 45, 67 and 70 yards in the second half as he gashed what had been an improved run defense for the Raiders (3-5). Martin, the 31st pick in April out of Boise State, became the first back since at least 1940 to score on three TD runs of at least 45 yards in one game, according to STATS LLC. Tom Crabtree had a 72-yard touchdown that was Green Bay's longest of the season, and Randall Cobb added two scoring catches. The Packers (6-3) finished with a season-high 176 yards rushing on 39 carries, the first time in a month they've cracked the century mark. James Jones also had a touchdown reception, and Green Bay goes into its bye week with a four-game winning streak. The break comes at a good time for the Packers, who lost Clay Matthews, Jordy Nelson and Bryan Bulaga to injuries. John Skelton was 23 of 46 for 306 yards, his most passing yardage since last December, but Arizona (4-5) lost its' fifth straight. Matt Schaub threw two touchdown passes and Arian Foster ran for 111 yards against Buffalo's NFL-worst rushing defense. Andre Johnson caught eight passes for 118 yards and Foster scored for the fifth straight game for Houston (7-1). Mario Williams had a sack and five tackles in his return to Reliant Stadium after he signed with the Bills (3-5) in the offseason. The Texans made Williams the No. 1 pick in the 2006 draft and he's still Houston's career sacks leader (53). Schaub won for the 10th time in 11 starts. He completed 19 of 27 passes for 268 yards. Cam Newton completed 13 of 23 passes for 201 yards with a touchdown and ran eight times for 37 yards and a score as Carolina snapped a five-game losing streak. The Panthers (2-6) were in desperate need of a win after a series of close defeats that had players questioning whether the team had any leadership. Newton responded with one of his best games of the season, including a 19-yard touchdown pass to Steve Smith and an 82-yard completion that set up a score. Robert Griffin III was 23 for 39 for 215 yards, ran 11 times for 53 yards and was sacked four times as the Redskins lost their third straight and fell to 3-6. Brian Urlacher became the latest Chicago defender to return an interception for a touchdown and Jay Cutler threw three TD passes to Brandon Marshall. Cornerback Charles Tillman forced four fumbles and Chicago created five turnovers while winning its sixth in a row. The Bears (7-1) scored a franchise-record 28 points in the first quarter. They took control by forcing three turnovers in the first 13 minutes and turning them into 14 points. Urlacher went 46 yards for his score. The Titans (3-6) lost their second straight with Chicago fans taking over LP Field, booing any video highlights featuring the rival Green Bay Packers and frequently chanting "Let's go, Bears." Tennessee's lone highlight when Chris Johnson scored on an 80-yard run in the fourth quarter. Marshawn Lynch ran for 124 yards and a touchdown, rookie QB Russell Wilson threw three first-half touchdowns, and Seattle overcame 182 yards rushing by Adrian Peterson. The matchup between the top two rushers in the NFL  Peterson and Lynch  didn't disappoint with Peterson having his best game since 2008. Lynch ran for a 3-yard TD in the third quarter, while Wilson threw TD passes of 11 yards to Sidney Rice, and TDs of 6 and 11 yards to Golden Tate for the Seahawks (5-4). Peterson and the Vikings (5-4) had 197 yards rushing in the first half, but only had 46 yards rushing in the second half. Quarterback Christian Ponder was 11 of 22 for 63 yards. Peyton Manning overcame a pair of interceptions by throwing three touchdown passes. Trindon Holliday also returned a kickoff a Broncos-record 105 yards for a touchdown. Manning improved to 8-0 career against Cincinnati (3-5), which has lost four in a row for the first time in two years. This win didn't come so easily. The four-time MVP threw a pair of interceptions  one in the end zone  that led to 10 points and a 20-17 Cincinnati lead early in the fourth quarter. That's when the Broncos (5-3) have been at their best. Manning threw a 1-yard touchdown to tight end Joel Dreessen that put Denver back ahead. After Andy Dalton underthrew a pass under pressure that was picked off by Champ Bailey, Manning put it away with a 4-yard pass to Eric Decker with 3:36 remaining. Joe Flacco threw a 19-yard touchdown pass to Torrey Smith with 4:26 as Baltimore won its 11th straight game inside the AFC North. Smith caught Flacco's strike and spun away from cornerback Joe Haden as the Ravens (6-2) beat the Browns (2-7) for the 10th consecutive time. It was also Baltimore's 15th straight win following a loss, and helped the Ravens shake off a 30-point loss to Houston two weeks ago. Baltimore improved to 5-0 after a bye week under coach John Harbaugh, who is 10-0 in his career against Cleveland. Phil Dawson kicked five field goals for the Browns. Mikel Leshoure ran for three touchdowns, Calvin Johnson got involved early and Detroit turned in its most complete victory of the season. Detroit built a three-score lead before halftime and coasted after the break. It was a much different feeling for the Lions (4-4), who trailed in the second half in each of their other wins. Leshoure finished with 70 yards rushing and scored on runs of 7, 1 and 8 yards, becoming the first in franchise history to run for three touchdowns in the first half. Not even Hall of Famer Barry Sanders accomplished that feat. Johnson, who got off to slow starts in Detroit's last three games, had five receptions for 99 yards before the Jaguars (1-7) even recorded a first down. He finished with seven catches for 129 yards despite playing through a knee injury.